Have you ever been at Magic Kingdom after the fireworks and the evening parade, and you are just trapped? You can’t move anywhere? Well, I have. It was on the Magic Kingdom’s 40th Birthday celebration, and my friends and I all staked out spots in the area near Crystal Palace to see the spectacular fireworks show that was planned to celebrate the occasion. The show was beautiful, but then the cluster of people wanting to leave started to rear its ugly head. We didn’t see the need to rush out since the park was still open, and we thought about heading back to Adventureland, but we, too, were stuck in our spots. We couldn’t make our way anywhere. This is where we coined the phrase, “Disney Anarchy.” There were people literally climbing over the fences with STROLLERS to climb in the grass to get around some of the chaos (I absolutely do NOT recommend that, by the way). It took a good hour to hour and a half to clear the area so that we could finally move. We felt like fish swimming upstream. So, why do I tell you this story? Because Disney has revealed that it will is changing the configuration of the hub area of Main Street, U.S.A., (nearest Cinderella Castle) to alleviate congestion that happens nightly at the park. This redesign will include new pathways, special fireworks and parade viewing areas (hello FastPass+), and beautiful gardens. Disney released a video showing an overview of what the work will look like when all is said and done. 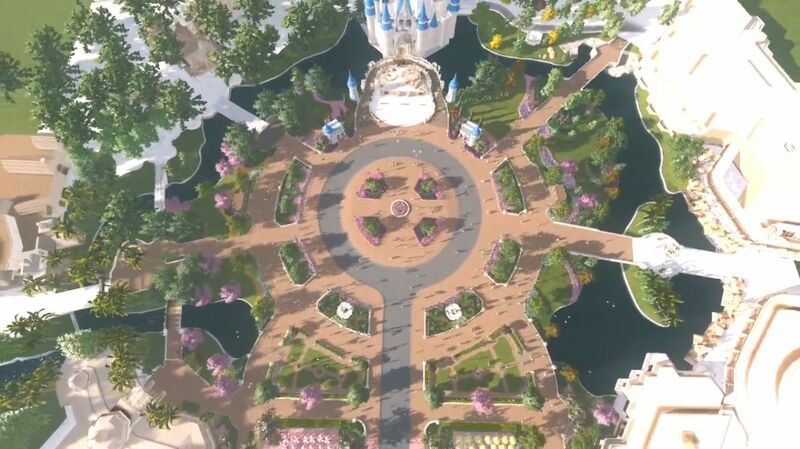 As you can see in the screenshot, there will be an additional circular walkway added to the main courtyard area, allowing people to have more room to walk and also more space to stand during the fireworks. 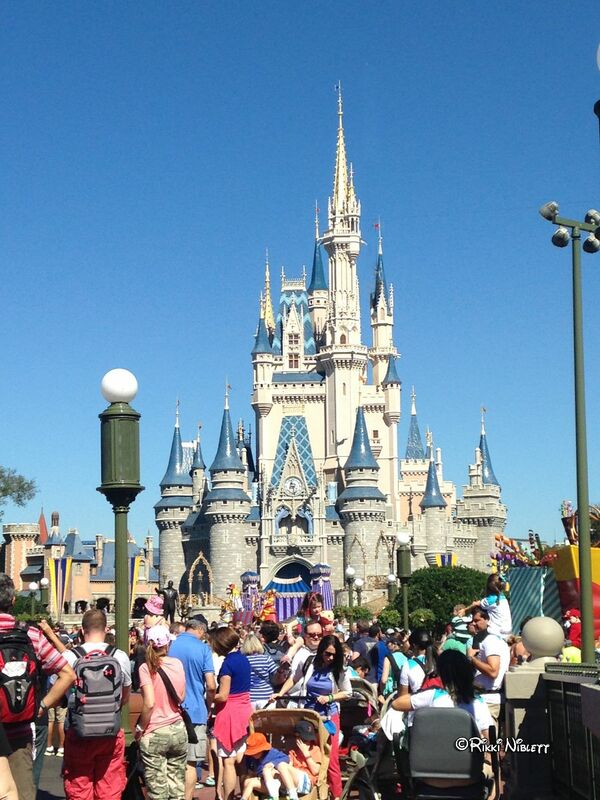 I also like the new castle turrets that are shown in the photo. This is the current Google Earth view of what the Hub area looks like, for comparison. 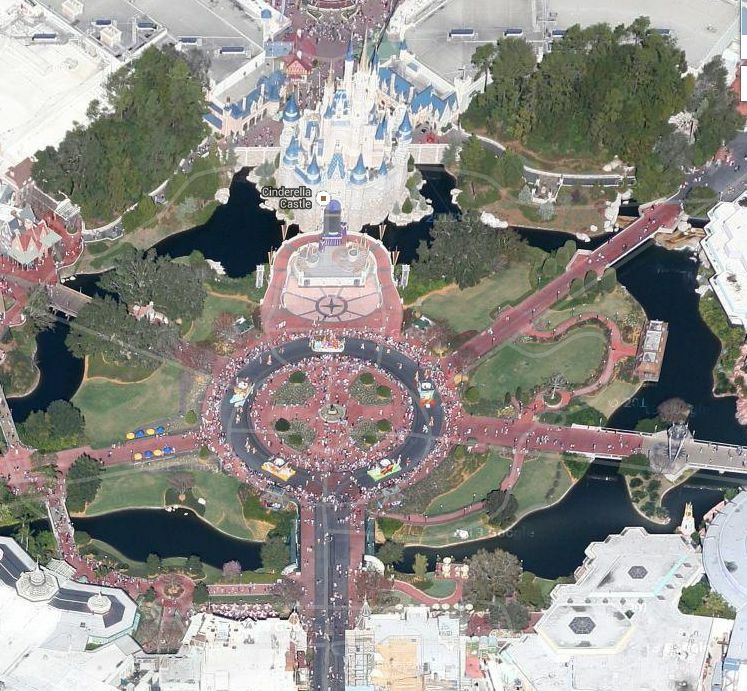 As you can see, the area funneling into Main Street USA will be vastly widened. Work on this new expansion is already taking place. Disney is already working on expanding the seating areas for both Casey’s Corner and for The Plaza Restaurant. While it may be a bit of an inconvenience for guests during construction, it will be absolutely welcome when completed (sometime in 2015). Thanks for the informative article. I’m wondering, before this work is done, where to best position yourself during the fireworks to avoid getting stuck after the fireworks if you plan to do more touring? We are loosing all that beautiful green space. I love that little meandering path that servese no real purpose. It is a nice break to walk along and take a moment to breath. I think the green space allows the castle to breath. It gives a nice break for the other lands and anchors the castle in place. 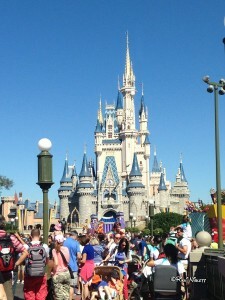 I think the new configuration will cause the castle to look like it is in a theme park. Yes, I know it is in a theme park, but it always looked like it was in a fairy tale. Also will we loose the moat monster? Moat monster? Now that’s something I haven’t heard about. Ah yes, I forgot about that path, that would be a bit of a loss. At the very least, maybe they could make the outer ring more pleasant and not so ‘cold’ as the top picture suggest. Maybe a series of paths. Planning on being there 2014 holiday season (before it gets crazy busy), hope they don’t have it all tore up just then! It seems like a slow process that’s taking place…so you’ll likely not be severely impacted. Work has already slowly been taking place. It makes sense, that is a lot of wasted real-estate with all that grassy area around the hub that I assume you are not even allowed to be on anyway. Partners, I would likely suspect, isn’t going anywhere. It will continue to stay in the middle section of the Hub. OK, I cranked up the video resolution and it looks like it’s still there, but the rest of the classic characters are gone. Or maybe they will be moved. Anyway, glad to see more space on Main Street. I too have been stuck in the sea of people after the fireworks. It looks like a good plan, I’m just worried it will get worse during the construction period. The construction making things worse before they get better is getting old, i.e. the parking situation at Downtown Disney on the weekends.